Shared mailboxes are just one of the many great collaboration features of Exchange, and probably the most used one. There is a lot of information about them on the web, for example this TechNet article. Unfortunately, there are still some common misconceptions around them, especially when it comes to ‘missing’ functionality. Most of those issues are caused by the fact that the shared mailbox is added as additional mailbox or automapped to the primary user mailbox. 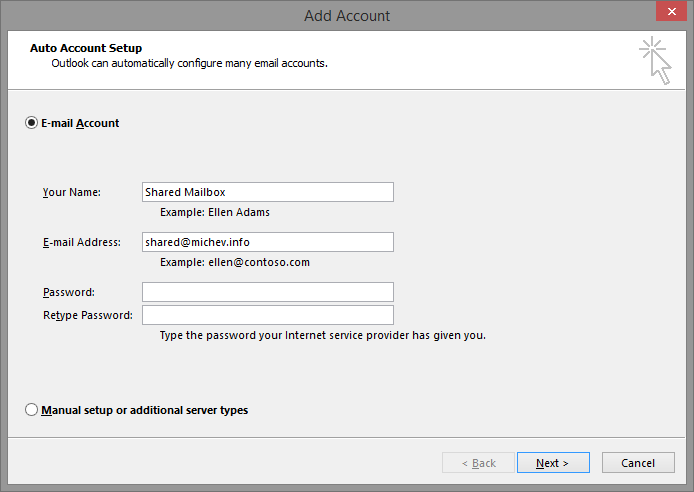 Outlook however will only expose certain features when the mailbox is added as normal (primary or additional) account. Example of such features/functionality include: Search, Inbox Rules, OOF replies, Categories, To-do lists. Other features will simply not work as expected, for example Private Items, Send on behalf/send As permissions. Another example of why you would need to add a shared mailbox as additional account includes the situation when you would like to perform a Mail Merge and send the messages using the shared mailbox account. 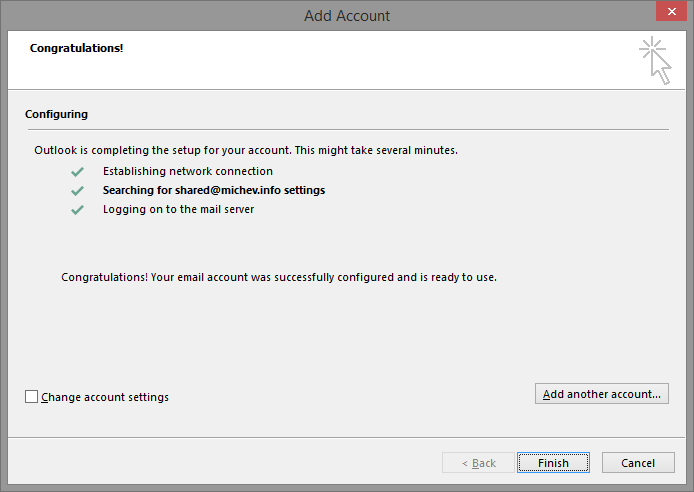 This article will guide you on how to add a shared mailbox as a fully functional additional account in the same or new Outlook profile. So how do you actually access the shared mailbox? The answer is, you need to be granted permissions, much like accessing another user’s mailbox. Full access, with or without Automapping, and recipient permissions in case you need them. The article above explains how you can add those, so I wont bother with the details. You can then simply press the Finish button to complete the process or configure any additional settings as necessary. If Outlook asks for credentials once you restart the client, make sure to again provide YOUR username and YOUR password. Thank you for your info to add shared mailbox. That’s usually caused by broken Outlook profile or some additional software locking the files up. Try Outlook in safe mode, disable any AV and other types of scanning/backup software and see if it happens again, or recreate the profile if needed. I have done this and changed the default address to the shared account before doing a Word mail merge to email. However, it uses my personal account, even though it is not the default. If I disable send/receive so I can change the From to the shared account, the email moves from my outbox to the shared outbox and gets stuck, with a similar error as mentioned above. I found on another site that it has to do with the default data file, which I can’t change as an end user in my company. The weird thing is, if I reply to one of the sent emails, it shows replying to the shared email address rather than mine. So it’s half right?! What you are describing sounds like the “additional mailbox” scenario, not “additional account”. Perhaps you had the shared mailbox added beforehand, or it’s automapped? From the IT guy: ..the only data file we use is the built in one for the first.lastname email……We no longer have separate or multiple .pst files associated with Outlook. The data file settings aren’t admin protected but since there are none associated with the email, you don’t have anything there. What do you see under File -> Account Settings -> Account setting? Both yours and the shared mailbox should be visible there, as well as their corresponding data files. Come to think of it, might be easier for you to just create a new Outlook profile (Control panel -> Mail -> Show profiles -> Add) and only add the shared mailbox in it. Update: It appears to be working. When I received a reply back from one of the emails, the ‘From’ part was the shared email, rather than mine, even though the copies in my sent folder did not read that way. So it actually was working correctly. Now if I could add a CC email from the Excel file, it would be even better and save me duplicating my efforts. Thanks for responding! I don’t think I have permissions for adding profiles, because of no pst files on our system. Absolutely fantastic suggestion, thank you so much for this. Would definitely recommend setting up an additional profile to avoid confusion! Thanks again, indebted to your help here. I have followed the above steps to add additional email account and set that as default. When I click on new message, it by default selects the shared mailbox in From field. However the mail merge still sends out mails from my personal email id. Any suggestions on what could be missing? I have admin rights over the shared mailbox that I’m trying to use. Tried everything from adding another mailbox profile from control panel – Mail – Show profile and using that while starting up outlook. Even that does not work. Any help is appreciated. For Mail merge to work, the account needs to be set as the Default one in the profile. So add the Shared mailbox as detailed above, but also make sure that the mailbox is configured as the default one. Or simply create a new profile with the shared mailbox only (no other accounts). Yes I have set the new shared account as the default one but still it sends out bulk emails from my personal account. Just tested it and it works fine with build 7766. Does this get added to Outlook as an Exchange account or IMAP? This is completely unsupported by MS, and if you go in to hybrid with EXO, and start migrating you will have some major issues with modern authentication during migration. Forgot to say, it can also trigger large amount of account locks on shared mailboxes due to the 401 of the autodiscover for the on-prem request in hybrid, which redirects with a needcred tag to EXO generating the popup. Any suggestion as to how to do this when using Outlook for Mac? Hi, One of my managers at work has access to a shared mailbox (it’s a time off request mailbox shared with all of the other managers). When she responds to an email it defaults to the shared mailbox email address as the sender. When she clicks to send it from herself, she has to search for her name each and every time, it doesn’t come up automatically when she clicks to add herself. Other managers have it as an automatic prompt, as if it remembers that they had requested to have an email sent from their personal email within the box before. She never gets that alternate user dropdown when working in the shared mailbox. She always has to search for herself with each and every email. Any idea how to add her, so she no longer has to search like that anymore? The send/compose behavior depends on how the mailbox is added in Outlook. If the mailbox is automapped or added as additional account, the delegate name will always be selected when composing new messages. If the mailbox was added via the method described above, it will default to the mailbox address instead. You might also want to check the “Always use the default account when composing new messages” option under File -> Options -> Mail -> Send messages. Is there a way to set the default response in a shared mailbox to come from the users default account? The scenario is our users all have read only access to the shared account, but we want all responses to come from the users profile, not the shared mailbox. Since the shared mailbox is added as additional account, replies will default to using the shared mailbox address. You can configure it as additional account instead, or simply instruct the users to choose the address each time. For new messages, you can set the File -> Options -> Mail -> Send Messages -> “Always use the default account” option, but that will not affect any replies. So probably best to change it to additional account instead. I’ve done this recently when trying to find a solution for allow search on shared mailboxes (both shared type and user type), but now I get issues searching the shared mailbox, it doesn’t load the OST files correctly (if you select the mailbox in account settings and view the summary below, the path to the OST is missing). I’ve replicated this on multiple accounts with shared mailboxes and just opening user mailboxes with permissions, on multiple different exchange tenants. 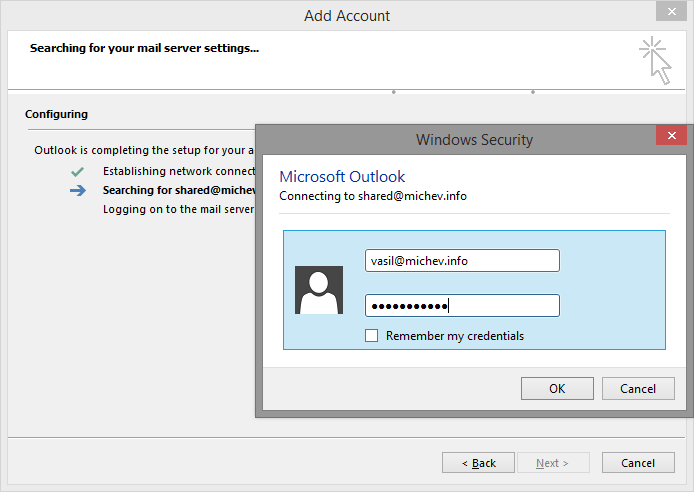 My problem with this is when I log into the shared mailbox using my own credentials, that when restarting outlook, it keeps asking me for my log in information. Even after filling in my own credentials and the official credentials for the shared mailbox, it does not log me in in the mailbox. Anybody experiencing the same problem? Not sure what you mean by “official credentials for the shared mailbox”. The method described above uses your own credentials, as delegate for the Shared mailbox. In any case, no prompts should appear after restart. Has anyone added a shared account recently? I cannot make it work today. I was able to successfully add a shared account to my office 365 email account back in March. Now it immediately asks for the password of the shared account and I cannot go further without a password and I can’t get it to take the password of the shared account. many thanks for your guide. But when I restart outlook it asks me to re-insert the shared@mail.com username and password, I insert my personal username and password then outlook show me this error message: “the name cannot be mached to a name in the address list”. I have a very similar problem in my company. I’m a member of a shared mailbox. When “replying all” I need my address to be shown as default (e.g. Michaela@x.com) instead of the shared mailbox address. I have tried both ways – add it as add. mailbox and add. account, but with no success. If you want *your* address to be used, you need to add the mailbox as additional mailbox or have it automapped. I have added a mailbox as a secondary (in Cached Mode) on a new computer and for the most part it works. The problem that I am having is it is not a shared mailbox but had 5 delegates. When I start Outlook sometimes the secondary account will start in Online mode with no Synchronization tab in properties. If I shut down Outlook a couple of times then it will eventually come up in Cached Mode and the Synchronization tab in properties is there. Is this because the mailbox was originally set up as an automap? There are currently 5 people using this mailbox, so I really can’t remove the automap, as theirs are working correctly. I have been running into a problem with the mailbox being automapped on new computers, its working fine on older computers. What can be done to fix this? Not sure Frank, you will have to troubleshoot this. The only thing that comes to mind is to re-add the permissions/reset automapping. Vasil, we have the same problem as Carlos mentioned in this thread on Aug 7 2017. When I set it up as you suggested I get an authentication prompt for the shared mailbox when I reboot, and also after that with a certain frequency, I guess it has something to do with the auto-discovery as Carlos suggested. If you enter personal mailbox user credentials the popup comes back, if you simply close the popup everything keeps on working, I have access to the shared mailbox. Both my personal mailbox and the shared mailbox are in O365 and I have full access to the shared mailbox. I didn’t get the authentication popups last week when the shared mailbox was still on-prem. Everything works but the frequent popups are very irritating. Any suggestions for this problem? Try reading the permissions now that the mailbox is moved.